ISIS released a statement today claiming American hostage Kayla Mueller was killed in a Jordanian bomb strike in Raqqa. It provided photos of a bombed building, but none of Mueller. Mueller is the last known American hostage to be held by ISIS. Long War Journal finds the claim "convenient". While it is certainly possible Mueller has been killed, the Islamic State's description of how she was allegedly killed could very well be a crude attempt at propaganda. ISIS also says the bombing of the building lasted an hour but no ISIS members were killed. It claims Ms. Mueller was killed by fire from the bombing. ISIS burned a Jordanian pilot alive, claiming its actions are justified by the pilot having flown missions for Jordan in which Syrian civilians, including children, were killed. It views the brutal murder as justified, under the Islamic equivalent of "an eye for an eye." IS believes in a principle known as "qisas" which, in its broadest terms, is the law of equal retaliation. Put another way, it is the Islamic equivalent of "lex talionis", or the doctrine of an eye for an eye. Within Islamic law qisas typically relates to cases of murder, manslaughter, or acts involving physical mutilation (such as the loss of limbs) and creates a framework for victims (or their families) to seek retributive justice. Update: Jordan has executed Sajida al-Rishawi and another al Qaida prisoner, Ziad al-Karbouli (aka Abu Houthiyfah), who was also sentenced to death. Are more coming executions coming? 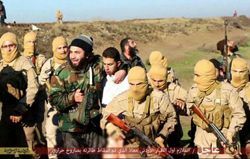 There are reports a Jordanian member of al-Qaida, Muammar Ahmad Yusuf Al-Jaghbir, was also moved to the execution facility. Al-Jaghbir was initially sentenced to death, but in 2009, his sentenced was changed to 15 years. On December 25, when reports first surfaced of an exchange of al Qaida prisoners with Jordan, al-Jahbir was mentioned, along with al-Rashawi and al-Karouli as those who could be released. The father of 1st Lt. Mu’ath al-Kaseasbeh, the Jordanian pilot captured by ISIS, has issued a plea for his return. "I direct a message to our generous brothers of the Islamic State in Syria: to host my son, the pilot Mu'ath, with generous hospitality," he said. "I ask God that their hearts are gathered together with love, and that he is returned to his family, wife and mother." "We are all Muslims," he added.